An enormous volcanic eruption would not necessarily plunge the world into a new societal crisis, according to a new study of the biggest eruption of the last millennium published in Nature Geoscience. The 1257 eruption of the Samalas volcano in Indonesia produced a dust cloud that blocked out the sun around the world, and has been blamed for triggering severe food shortages and turmoil worldwide. But analysis of nearly 200 medieval manuscripts, as well as tree-ring and ice core data spanning more than a thousand years, has revealed Samalas may not be the ultimate cause of the crises, states Dr Sébastien Guillet, lead author of the study at the Faculty of Science, University of Geneva. Dr Pablo Ortega, a climate scientist at the University of Reading scientist, who was involved in the research, said: "There are numerous indications of extreme weather conditions with serious societal consequences following the eruption, but also show that climatic conditions were back to normal by 1259 over most of Europe. "While these extreme weather conditions originate at the Samalas eruption, our research shows it only played an aggravating role on the subsequent crises." Evidence showed famines in England and Japan had already begun before the eruption occurred. 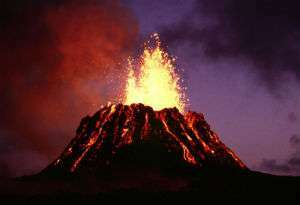 The scientists therefore argue that volcanic cooling might be less likely to lead to global crises than previously thought. Documents from the years after the Samalas eruption describe the dimming of the sun, leading to cold temperatures, incessant rain and increased cloudiness, with one source from 1258 stating "There was no summer during summer". Descriptions of crop harvests following the eruption reveal they suffered badly, with wine production in Europe destroyed by "rock hard" grapes. In addition, chronicles suggest a normal climate had resumed within four years of the eruption, contradicting previous model results suggesting temperature drops of as much as 1ᵒC until 1264. The scientists found the magnitude of the cooling by the Samalas eruption was very similar to smaller later eruptions, highlighting that the amount of sulphuric ash thrown into the air does not appear to directly correlate with the cooling effect on Earth. Dr Ortega said: "Should a massive volcanic eruption occur in the next few years, its consequences for society might still be still difficult to predict, as the world in which we live in is more vulnerable and more exposed." That weather mod from the 1257 eruption sounds like that which produced the 'year without summer in 1816.